…and it’s not just because of the pretty shoes. I tweeted yesterday that I liked the Tony Bianco Facebook page. While working on Facebook I had seen the Tony Bianco page come up because a friend of mine liked it, so I thought I’d stop by and check it out later. Now I’ve seen some great Facebook pages, and I read/follow a lot of people in the industry that do some fantastic work with Facebook, but this page immediately impressed me. Partly because I’m a woman (and for full disclosure, I already own a couple of pairs of Bianco shoes). 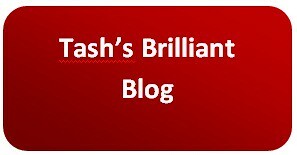 But there were other elements that I just thought took all the best practice elements of social media and fully utilised them. This should go without saying for all consumer brand pages. If your brand has something that can be bought, consumed, used, visited… the list goes on… then the page for the brand should encourage users to interact and post content. It has been said over and over again that one of the main strengths in social media lies in the fact that people trust people like them – so the brand becomes validated if people are passionate enough about it to post photographs, stories of experiences etc. 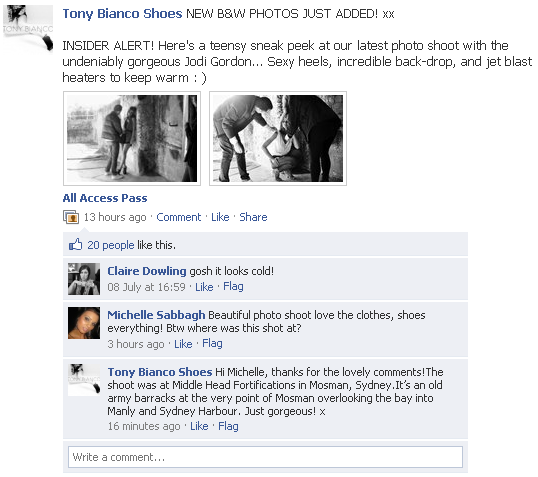 I liked how on the Tony Bianco page, even though the shoes bought weren’t even from a authorised store but eBay, the page moderator commented and asked them to post photos – it made it sound like Tony Bianco was just as excited about the shoes as the customer! Responses to queries about where to find a particular shoe don’t go unanswered – the page moderator finds out for you where the shoe can be found, and gives numbers to ring! I love this – one of the attractions of social media is that it offers an opportunity to provide customer service in the mediums that are already in everyday use by the customer. In fact, I see a lot of companies using the customer service function as the main launching step for their social media interaction. While social media can offer a lot more for brands and there should be a comprehensive strategy to ensure all the potential is utilised, customer service is still a function that shouldn’t be ignored. And to be honest, I’ll almost certainly use that function on the Tony Bianco page at some point to find out where I can get the heels I just fell in love with in my size. It gave me a thrill to look through the behind the scenes photos from their new range. Social media offers the chance for brands and companies to really show their customer that they appreciate them, and give them an inside first look. Make those customers feel valued. Make them feel like their comments matter. Too many times have I seen a poorly managed Facebook page where the company/brand thinks that they can let people chat away among themselves – or worst of all, ignore direct calls for assisstance. Running through the last few weeks of posts on the Tony Bianco page, I haven’t yet seen one comment that didn’t have a reply from the moderator. And what are those people going to do now they know they’ll always get a response? Post more, interact more. Perfect. So I lied when I said this wasn’t just about pretty shoes. It is all about pretty shoes. But I’m the exact target market for that page, and that I think is the point. All the things they’ve done are right on the mark for me and all other women like me. It’s exactly what I want from a brand that I like on Facebook. And in that, they’ve crossed the line, gotten me to interact, and are now going to be part of my everyday experience when I log into Facebook. Whereas before I would likely see their name once a week in a shoe store I passed, I’m now going to see it daily. And I’ll be that much more likely to buy (another) pair of Tony Bianco shoes because of it. They’re just so pretty!